IT’S A ROCK STAR CHRISTMAS PARTY! MUSIC VIDEOS: The theme is rock star, so we will be showing music videos starring students and Specialists! Want to in one of the videos, contact one of the AIEP Specialists! One video will be awarded Video of the Year!!! KRISS KRINGLE: Bring a gift, and get a gift! Please make sure that your gift is at least Php 300. If you’re feeling generous and you want to go over Php 1,000, go for it. If you’re a real rock star, you can bring a gift for everyone. DANCE: Make sure you come in your dancing shoes! Our DJ will blast the music from the rooftop! Rockstars move the way they want to, so don’t be shy! FOOD AND DRINKS: It will be a pleasant surprise 🙂 One thing for sure: there will be lots of food! So come with an empty stomach! Drinks! Flowing! It’s a party, right? HOW MUCH? Only Php 500. That covers all the expenses for a very fun night!!! AFTER PARTY: Sure! We can go to a club afterwards as well. Rock Stars party all day and all night! Feel free to invite your family and friends. 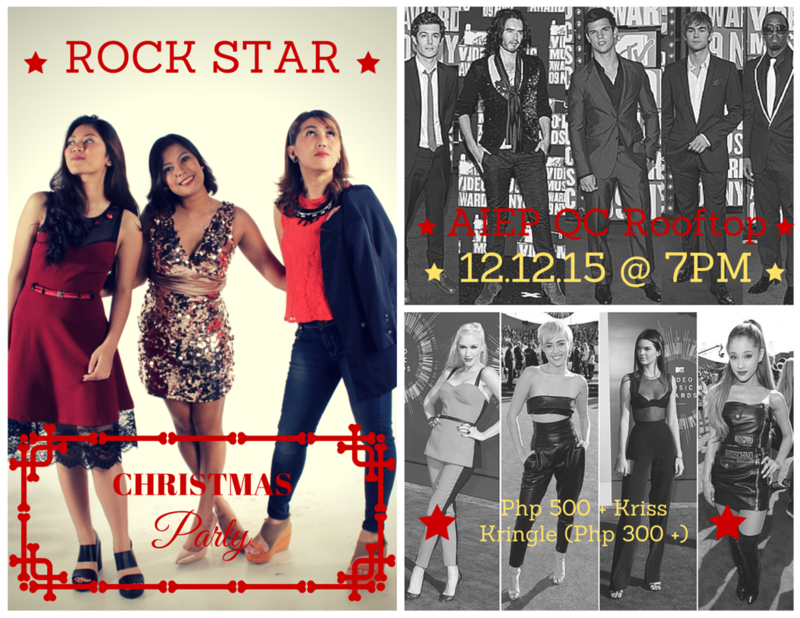 This party is for everyone, and we will surely Christmas rock the night away.